> I'm sure others will chime in with information on your other questions but I'll answer this one. > Assuming you are using pdflatex to typeset your document I'd suggest using the pdflatexmk engine supplied with TeXShop. It uses the latexmk program to automatically take care of all the necessary runs of pdflatex, bibtex/biber and makeindex to fully typeset your document. Not only that, the latexmk program also automatically detects that the bibliography should be compiled with biber so there is no need to change TeXShop's preference; although that does no harm. > To use the pdflatexmk engine first check to see that it's active; recent versions of TeXShop activate it by default but, if you have used older versions it had to be activated manually. To do that check simply check to see that you see pdflatexmk in the popup list of engines that appear in the Source or Preview window's toolbar. Hi Herb. I am using TeXshop 3.11, installed with the TeXLive 2012 distro, but pdflatex doesn't appear in the list of engines.I've attached a screen shot of what the list does in fact say. 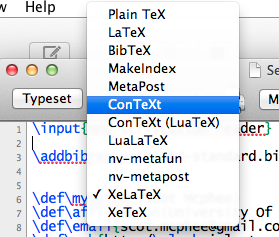 In the 'typesetting' tab of the preferences, there is a "Default Command" set of options with the options TeX, LaTex, ConTeX, and Command Listed Below, which is selected and which I've typed into its textfield the value; "XeLaTeX". There is another group of buttons with the label "Default Script" of which the first and selected option is "Pdftex", the other options are "Tex + DVI" and "Personal Script". I will have to explore this in more depth (i.e. do the other steps you've indicated to activate it) tonight my time; I've got to run out the door right now.